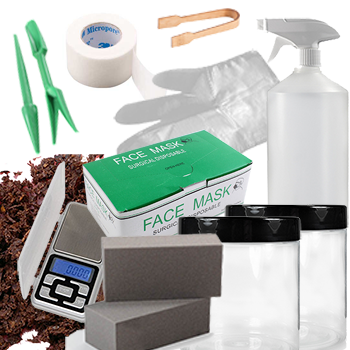 This kit of supplies provides everything you need to grow two healthy large larvae. (you may later require more substrate depending on stage/species). - Humidifier spray: Makes it easy to keep the jar and its contents moist but not wet. - Pupation chamber material x2. Lets you sculpt a secure chamber for pupation for each larva. - Anti Pest tape. Our easy to tear breathable tape for covering ventilation holes on your larvae containers. All of the items are available separately in the shop but this convenient kit gives a 10% price discount to help you care for your beetle larvae.